Member Joel Spivak continues to commemorate National Hot Dog Month in various places around the city. He will be grilling and handing out franks to celebrate the grand “reopening” of the The Blue Grotto, an arts and event venue on Lancaster Avenue. Joel has long studied and promoted this area of the city, in the shadow of Drexel and the University of Pennsylvania. The Blue Grotto gallery of found objects and light is an artistic expression of dedicated members of the Dumpster Divers of Philadelphia, now in their 25th year. We will be grilling dogs from 6p until they’re all gone! There will also be a jazz concert at the CEC as a kickoff to the Lancaster Ave Jazz Festival which will be Saturday 7/15. Come enjoy a hot dog, some jazz, great people, and the bluest room you can imagine! Two giant stationary steam engines, one in Bethlehem, PA, and another half an hour away in Phillipsburg, NJ, are now in the process of being restored to operation. 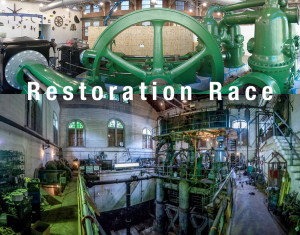 Come along with the crew members on Sunday, July 16th, at 3:30 PM for the second of several tours where visitors can get an up close look at these machines to learn what is being done to make them run again. The tour will begin at the National Museum of Industrial History inBethlehem, PA, where the former York Water Company horizontal steam powered water pumping engine is in the final stages of restoration. The 103 year old machine is 35 feet long, weighs 115 tons, and pumped 8 million gallons of water a day. The challenges of relocating and now refurbishing this mechanical marvel will be detailed. The tour will then carpool to the historic pump house cared for by the Friends of the NJ Transportation Heritage Center in Phillipsburg, NJ, to see Big Allis, the 1913 steam powered water pump. Rated for 6 million gallons of water a day, this three cylinder, two flywheel, vertical engine stands 51 feet tall and is surrounded by a complete steam plant with the original boilers, condenser, and backup turbine. Tickets are $22 and can be purchased in person upon arrival at NMIH in Bethlehem. The proceeds will be split equally between the two restoration projects. This tour has been fully subscribed through emails to Oliver Evans Chapter members. Attendees will have a private tour of the working shipyard located near the main drydock of the former Naval Base. To be informed of future tours and events please enter your email to follow the blog on the homepage of this website.